You provide the T-shirts and we give you a completed quilt! Wash the shirts in washing detergent, but please do not use fabric softener. Fabric softeners contain wax that hinders the effectiveness of the stabilizer. Leave the shirts intact. We will cut them down to get the desired size. The finished quilt size will depend on the size of the squares and the number of shirts. For a balanced quilt, ideally you use 9, 12, 16, 20 or 25 shirts. 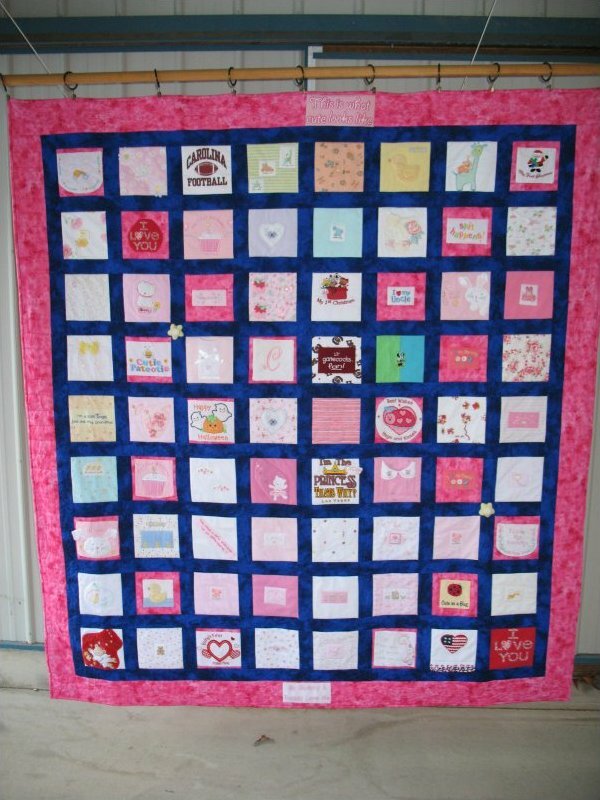 If you have less, or more, there are ways to still get a quilt the size that you want. Let us know how many you have and we can create a design for you. If the shirt has other logos or printing (in addition to the main design), then these can be attached in different ways to be included in the finished quilt. If you have one quilt square that includes the front and back of a shirt, it will count as one square. If you have two quilt squares made from one shirt, it will count as two squares. If you have a unique design challenge, there is usually an answer to it. We would love to help you answer it!